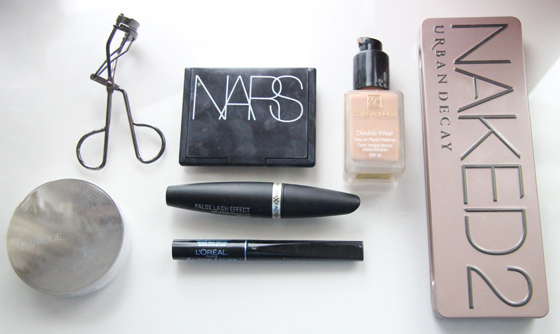 This are my favourite post, so I finally decided to do my own everyday make-up routine. I love finding out what people use in their everyday make-up routine. I haven't included any blushers as I just started to experiment with them and I don't really wear them every day. I also didn't include highlighters and brow fillers as I don't use them everyday. ESTEE LAUDER DOUBLE WEAR FOUNDATION: I have it for over a month now and I must say that I love it! The first medium coverage foundation, which covers my red cheeks. That's why I never used to use blushers (If I do, I tend to go for brownish tone ones, than pink tones). I normally mix this foundation with Revlon PhotoReady foundation, for slightly lighter coverage. My shade is 1N1 ECRU. CLINIQUE REDNESS SOLUTION POWDER: I use it everyday and this products seems never ending, I have it for over a 6 months. It's yellow powder, which on skin becomes clear. It's very lightweight powder. NARS "LAGUNA" BRONZE: This bronzer is perfect for pale skin. First when I saw it in store I got scared! It looked so dark in the pan, but when swatching it, it wasn't bad. 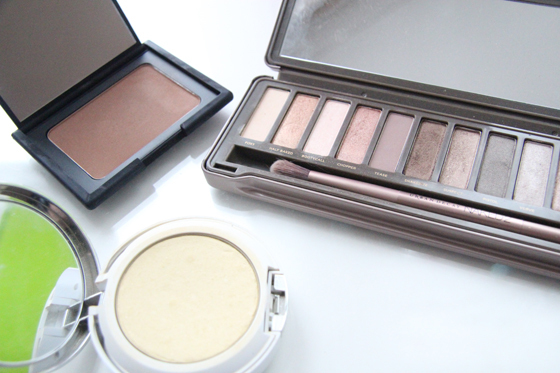 URBAN DECAY NAKED2 PALLET: This is my new bad boy! I have Naked1 pallet and I also love it, but I tend to use this one everyday. I think that Naked pallets are great investment, as you won't need any more eyeshadows. I also own two MAC eyeshadows and that is it, I don't feel like I need more.I also love using the brush which came with it. NO 7 EYELASH CURLER: I had never uses eyelash curlers before, as I didn't seem to need them. I recently had picked up the No 7 one and I like it so far. My eyelashes are naturally quite curly. MAX FAXTOR FALSE LASH EFFECT MASCARA: I normally go for different mascaras, when I run out from my old one. This time I decided to give a go to Max Factor mascara, and I must say that I love it. I might stay with it for longer! The brush is amazing. L'OREAL CARBON GLOSS EYELINER: Favourite liquid eyeliner of all time, it's very black! I also like the brush. I do change my routine quite often, sometimes I just go for lighter foundation, when I don't need so much coverage, I like to use Chanel Aqualumiere or Revlon PhotoReady foundation. I want to buy all of these products right now! I really especially like the NARS Laguna, I really need to buy it! I really want to try the No.7 eyelash curlers, the ones i have at the minute are too big for my eyesockets. wierd! I love this mascara! eyes look amazing with it! We have nearly the same make-up routine! I don't have the Nars Bronzer but I'm planning to get it when it goes on Buyapowa.